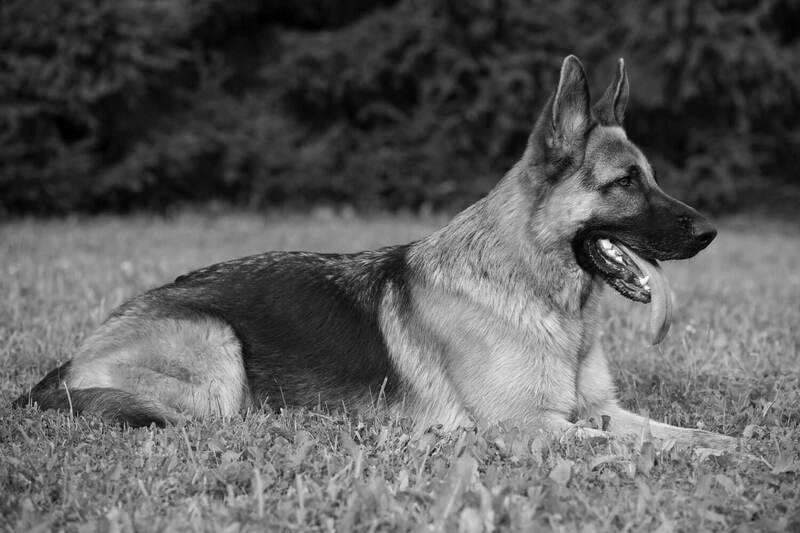 There are many products available that contain all the nutrients your dog needs. 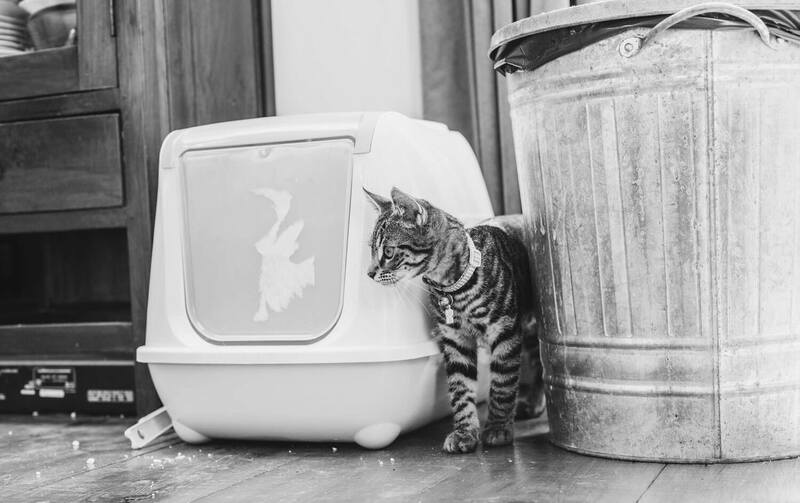 Dry food, canned food, raw food or even home cooked meals are all viable options. However, when it comes to French bulldogs, you need to take a closer look at what’s written on the packaging. These affectionate little pups have a rather sensitive nature. 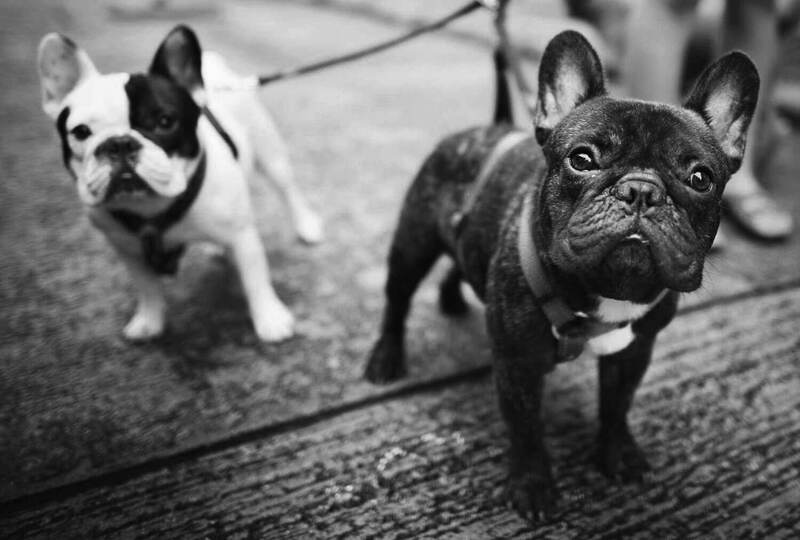 French bulldogs are prone to developing food allergies. This is why some companies produce dog food that leaves out potentially harmful ingredients. 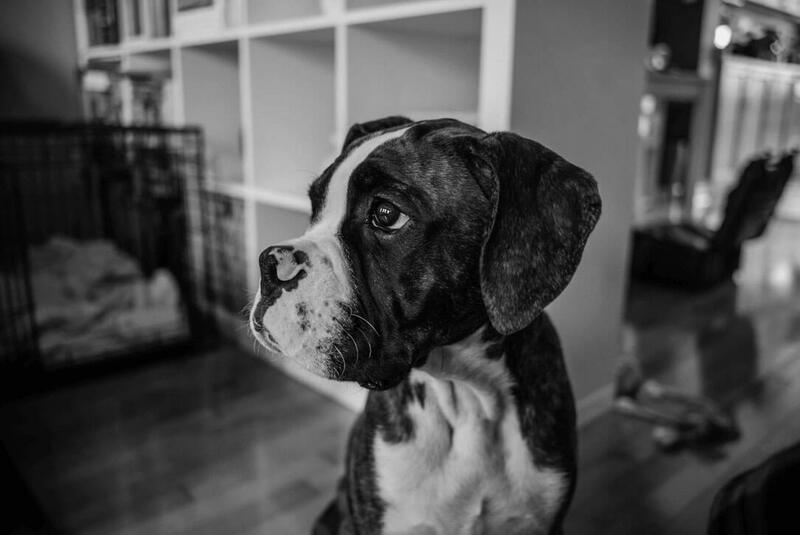 Although allergies develop over time, it is quite common for Frenchies to have allergic reactions to commercial dog food mainly because of the additives used. This article compares three of the best dog food products made with healthy ingredients. It will help you understand what to look for in commercial packaging. We will also give you our recommendation as to which product has the best overall features. The BLUE Life Protection Chicken & Brown Rice is a protein-rich recipe made with top 3 ingredients of deboned chicken, chicken meal, and brown rice. Dogs need their protein and the chicken offers a balanced way for them to get it. Brown rice has less fat than white rice but at the same time, it has more protein. This is one of those grains that work well for both humans and dogs. If you don’t have the time to prepare meals for your dog then the Protection Formula from BLUE Life is a good choice. Depending on individual needs, this 30Lbs bag can last your French bulldog more than 2 months. The bag does come with a feeding chart for different weight classes. If you’re not sure how much you should feed your pet, this chart can come in handy. This dry food product also is a good source of vitamins and minerals your dog needs for a healthier life. It has calcium and phosphorus to help keep your dog’s teeth strong. 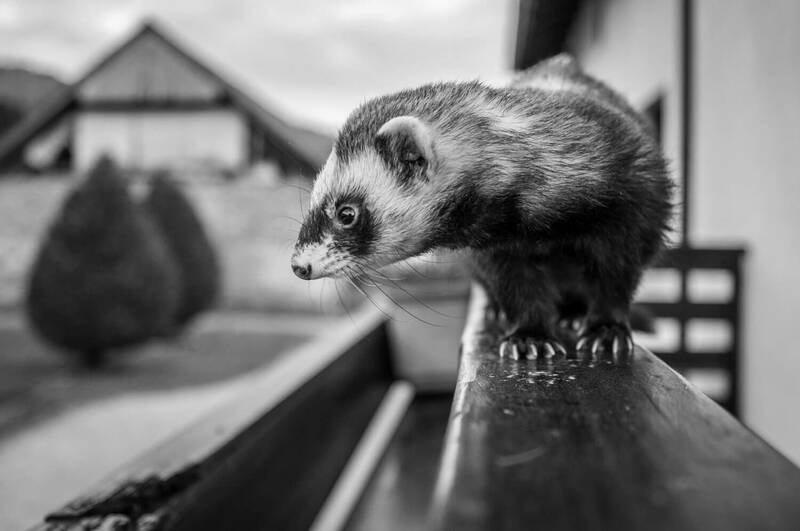 There is also a good supply of Omega 6 fatty acids which will help maintain healthy skin and shiny fur. 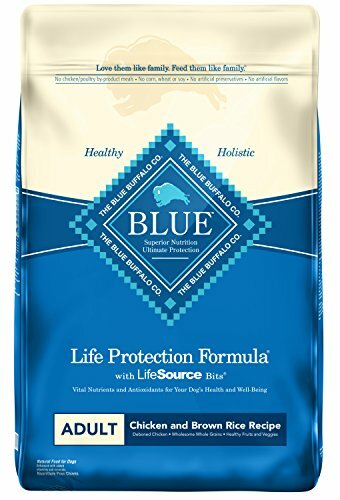 The BLUE Life Protection Formula is a well-rounded dry dog food product that uses no artificial additives and avoids some of the main allergens like soy. Your French bulldog will thank you for this. It’s fitting to see a brand like Royal Canin making kibbles that are easy to eat. Nothing says Royal like having perfectly designed shapes that your French bulldog can grab and chew with ease. Of course, the real reason behind the shapes it to increase the dog’s interest in chewing properly. The Royal Canin’s French bulldog adult dry food contains 24% protein. The protein is mostly from brown rice, chicken by-product, and chicken fat. Dog food that contains chicken by-products or other meat by-products could contain unwanted additives. There are several grades of chicken by-product meals in the dog food industry, but you can trust Royal Canin to use only the higher grades of meat meals. These kibbles are high palatable so chances are your Frenchie will gobble them up. 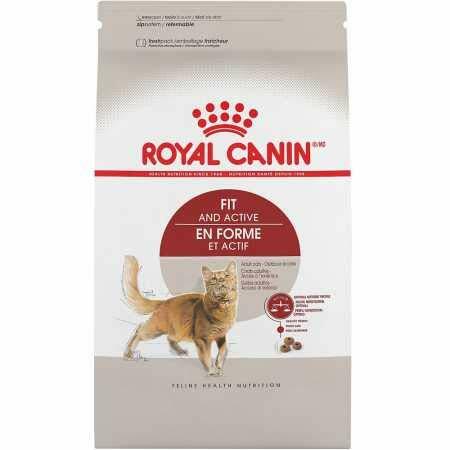 This dry dog food from Royal Canin is a good option for French bulldogs over one year old. It provides them with enough protein to maintain muscle mass, optimum level of fat for instant energy, and minerals for healthy skin and fur. However, if you don’t like the use of meat by-products, this might not be the right choice for your dog. 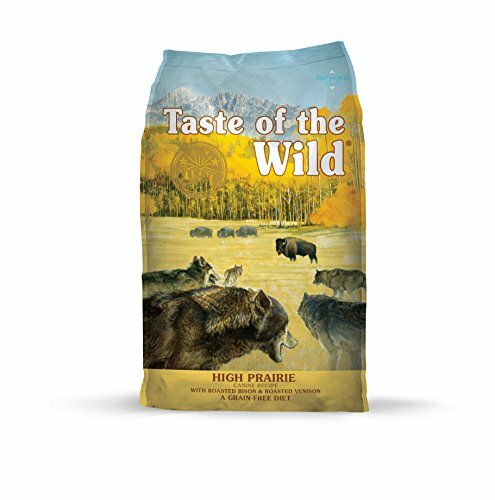 The Taste of the Wild High Prairie is a grain-free formula. Lamb, chicken, venison, and bison are healthy protein sources which also make for a very gourmet meal. The food is extruded into small round kibbles which make them good for both adult dogs and puppies. There are specific instructions on the bag that allow you to feed your dog according to his weight. This is a good guide for maintaining a healthy weight, but you may have to adjust the quantity based on your Frenchie’s activity level. The calorie content is 3,719kcal/kg, which is high for this food’s price point. In contrast, the most expensive dry dog food like Orijen is twice the price but only about 150kcal/kg higher in calorie content. Sweet potatoes and peas pair well with the meat ingredients used. The combination of fruits, veggies, and cooked meats is a healthy lifestyle choice you can make for your pet. There are also some vitamin supplements in this recipe. Most notably you will find vitamin D, B12, A, and E in larger quantities. Vitamin E, in particular, is very important for keeping your dog’s muscles and circulatory system in top shape. The Taste of the Wild High Prairie is a well-balanced diet for any dog. It is even more effective for French bulldogs because it doesn’t use meat by-products as a source of protein. Instead, it makes use of cooked meats (roasted) and high quantities of fruits, veggies, and crucial vitamin supplements. The BLUE Life protection formula is made of quality deboned chicken and brown rice which are both good sources of protein. The vegetables used provide most of the essential vitamins and minerals your dog needs to stay healthy and look good. Royal Canin’s Breed Health Nutrition kibble is one of the best products for adult French Bulldogs. The brown rice and high-quality chicken by-products take care of your dog’s protein needs. If your pet doesn’t have a healthy chewing habit then the shape of this kibble will get him eating properly again. While all products have their merits, our number one pick is Taste of the Wild High Prairie. This dry food recipe uses the best ingredients with high nutritional values. Apart from the variety of cooked meats used (bison, venison, lamb, etc. ), vegetables and fruit there are many vitamin supplements added to the mix. All these put together make the best all-round dry dog food for both puppies and adult French bulldogs.